In the final contribution to "Ecologies of Data," Mashinka Firunts explores the labor, gendered politics, and affective registers of data maintenance. Firunts asks, "What does the labor of data maintenance look like? How can we visualize what may appear as invisible work?" Mashinka Firunts is a PhD candidate in the University of Pennsylvania’s History of Art department. Her research project, “Performing the Pedagogy of Protest,” traces the history of the lecture-performance in critical art practice. With Avi Alpert and Danny Snelson, she is a member of the group Research Service, whose projects explore performative scholarship and media pedagogy. She is the co-editor of Present Tense Pamphlets, a publishing platform for score-based performance released through Northwestern University and the Block Museum of Art. Posed in 1969, the question who’s going to pick up the garbage on Monday morning? cannily anticipates a contemporary addressee. Writing in her “Manifesto for Maintenance Art,” the artist Mierle Laderman Ukeles plots a set of coordinates where art and ecology might stage a meeting: at the intersection of service work, “earth maintenance,” and an ethics of care. Mierle Laderman Ukeles, Hartford Wash: Washing, Tracks, Maintenance Outside, 1973. Via Timeline.com. What does the labor of data maintenance look like? How can we visualize what may appear as invisible work? How to preserve data that sustains ecologies under the threat of deletion in the Capitalocene? For artists and scholars, this form of working can mean methodological recalibration. Building structures like DataRefuge involves a method whose constitutive tasks may be collaborative, repetitive, and anonymous. It yields no products easily circulated in academic journals or edited volumes. Its stewardship is distributed across assemblages of scientists, hackers, students, professors, and beyond. Its aim is the maintenance of digitized spaces whose datasets are, in turn, vital to maintaining the ecosphere. Mierle Laderman Ukeles, Hartford Wash: Washing, Tracks, Maintenance Outside, 1973. Via Artsy. a container of ravaged land. In 1977, Ukeles became the inaugural artist-in-residence at the New York Department of Sanitation, staging an eleven-month performance involving sanitation employees. Twenty years later, her focus shifted to the Fresh Kills landfill in Staten Island, a site she surveyed with an eye toward the multitude of workers who render it operational. Ukeles compiled what she described as a “university personnel list” of its 500-plus contributors, from soil scientists and geologists to metalworkers and administrators. [iv] Performing their disparate tasks to aggregate data about Fresh Kills, Ukeles undertook microbial imaging, field recordings, and GIS mapping. 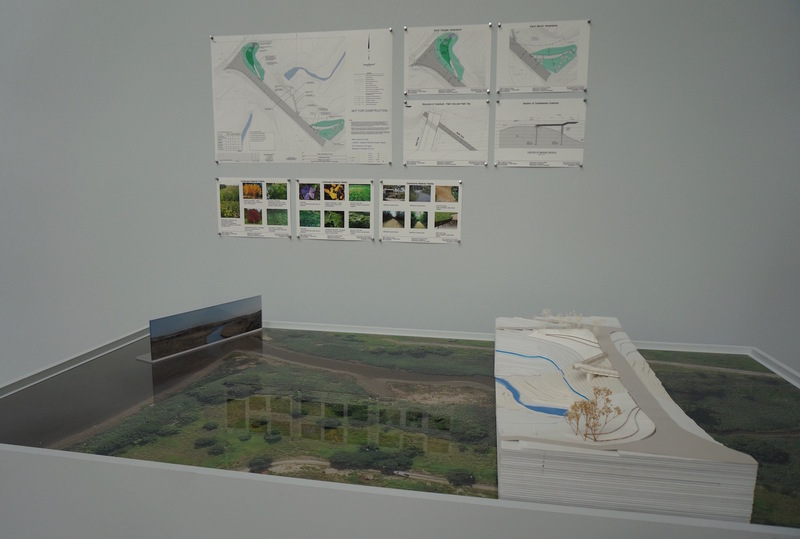 This period of data collection preceded Ukeles’ Landing (2008-ongoing), a proposal for transforming the landfill into a publicly accessible park populated by earthworks that function as visual markers of its metamorphosis. Mierle Laderman Ukeles, Landing, 2008-ongoing. Via Hyperallergic. Landing finds itself a conceptual companion to projects like Mel Chin’s Revival Field (1991-ongoing). Partnered with research agronomist Rufus Chaney, Chin establishes methods for detoxifying the cadmium and zinc-contaminated soil at Pig’s Eye Landfill. What results is a work of ecological sculpture forged through the subtractive gesture of “carving” away blocks of pollution. In anticipatory dialogue with Donna Haraway’s “hot compost piles,” projects like these hinge on collaboration across specializations. Their products and constitutive processes are often invisible. They remain untranslatable into any single disciplinary discourse. Mierle Laderman Ukeles, Landing Site Plan: Overlook and Earthworks, 2008-ongoing. Via The Freshkills Park Alliance. How might this model of working come to bear on ecologies of data? What form might assemblages working toward data maintenance take? One generative example presents itself in the Art+Feminism Edit-a-thon. Responding to the statistic that 88% of Wikipedia contributors identify as male, the global initiative convenes an annual constellation of students, librarians, professors, artists, and art workers for a period of marathon editing. Its aim is to rectify gender gaps in the public repository of knowledge through collaborative production. It reroutes the anonymous, unseen activity of entry-writing toward the space of the public event. Photographic documentation of edit-a-thons zeros in on “action shots” featuring users at their consoles: huddled over, fingers at the keyboard, and in the throes of immersed cognition. Images that point to a model of civic engagement not premised on the bombast of grand, mediagenic gestures. Instead, the Edit-a-thon offers the modest tactic of building on what is already there—improving upon existing datasets and inputting them where they might be missing. Art+Feminisms Edit-a-thon, 2017, on the theme of José Esteban Muñoz’s disidentification, Archives Nationales, Paris. Photograph by Vinciane Verguethen. Via i-D.
There’s a distinctly performative dimension to these proceedings, underscored by a theatrical dialogue between performance icons Vaginal Davis and Wu Tsang in a recent Paris-based iteration at the Archives Nationales. In this way, the Edit-a-thon casts the otherwise banal activity of database maintenance as a collective, globally dispersed performance unfolding in a shared open source environment. Performative talk given by Vaginal Davis and Wu Tsang, Art+Feminisms Edit-a-thon, 2017, on the theme of José Esteban Muñoz’s disidentification, Archives Nationales, Paris. Photograph by Noémie Girard. Via Twitter. In a more explicitly cross-disciplinary effort, the New Delhi-based Raqs Media Collective co-founded Sarai in 2000: a public access research platform housed at the Centre for the Study of Developing Societies. Sarai brings together artists, programmers, researchers, and community members—forming a “coalition of media practitioners” engaged in the study of technology and urban space. The Sarai project “Climate Change and Uncertainty: From Below and Above” expands the purview of climate analysis beyond the realm of scientists and experts to foreground local perspectives on ecological transformation. “FLOSS – Free/Libre Open Source Software” promotes free software practices through workshops, lectures, and multilingual free-to-download publications. The Sarai Reader series gathers anthropologists, media scholars, art historians, and artists in thematic issues on “The Public Domain,” “The Cities of Everyday Life,” and beyond. “Climate Change and Uncertainty: From Below and Above” workshop, STEPS Centre, New Delhi, January 2016. Via STEPS Centre/Flickr. Raqs Media Collective, Time Capsule from 2011 (to be opened in 2061), 2011-ongoing. Aluminum box with contents. Via raqsmediacollective.net. Preserving ecologies of data lies at the core of many of Sarai’s efforts. Describing the initiative in this vein, Shuddhabrata Sengupta calls it “a kind of time capsule of the 21st century in Asia.”[v] Translating these critical coordinates into artistic output, Raqs produced Time Capsule from 2011 (to be opened in 2061). Its contents are sealed in an aluminum box in Norway’s Østfold county, slated to remain hidden for fifty years, interred in the earth. The earth in Greek, Raqs notes, is “oikos – homestead, hearth, host, house – root for everything from ecology to economics that pertains to the care and upkeep of our base-camp in the stars.”[vi] In Time Capsule, the soil is cast as accomplice to its own unseen upkeep. Datasets—like our ecological present—are ephemeral, precarious, and subject to destructive forces. They require maintenance work: seeding the present toward the potential of a future user. [i] T. J. Demos, Decolonizing Nature: Contemporary Art and the Politics of Ecology (Berlin: Sternberg Press, 2016), 7. [iii] Miwon Kwon, “In Appreciation of Invisible Work: Mierle Laderman Ukeles and the Maintenance of the ‘White Cube,’” Documents no. 10, Fall 1997, 17. [iv] Mira E. Engler, Designing America's Waste Landscapes (Baltimore: Johns Hopkins University Press, 2004), 99. [v] Shuddhabrata Sengupta, “Presentation by Shuddhabrata Sengupta from Raqs Media Collective,” Asia Art Archive in America, March 9, 2012, http://www.aaa-a.org/programs/presentation-by-shuddhabrata-sengupta-from-raqs-media-collective/. [vi] Raqs Media Collective, “Three and a Half Conversations with an Eccentric Planet,” Third Text 27, no. 1 (January 2013): 108.